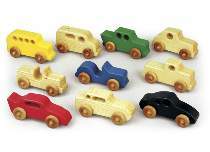 This cute set of ten cars is very quick and easy to build. Use 1-1/2" lumber. These projects are a lot of fun for kids to play with. All patterns drawn FULL size. Order 40 each #W150 Wheels and 40 each #AP1 Axle Pegs separately (four of each per car).